Mumbai Weather Outlook Put up on Mumbai Page . 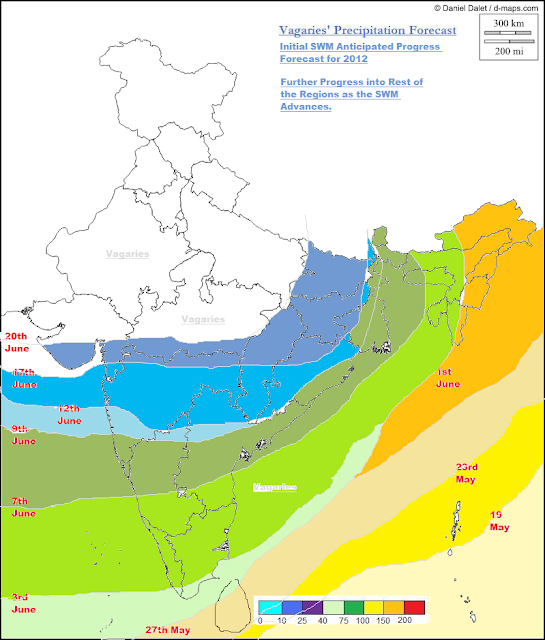 Monsoon Watch-6 -Advance, Quantum and Initial Strength. This Watch will evaluate the progress of the SWM advance, and its estimated initial strength. Feeble Monsoon has entered the Southern Bay Islands. Port Blair (South Island) has received a heavy thunderstorm on Saturday evening, with 69 mms till 5.30pm Saturday, and 552 mms from March this year. In the Bay sector, the attached UTH map shows the advance of a SWM current in the Southern regins. SW winds are geared up, but lack speed, as they are still below 20 knts. An embedded UAC is now seen in the Southern Islands area. An "in situ" low from this is expected by the 22nd (mentioned in previous blog), as the SST is now conducive at 31/32c. And which would trigger the SWM into the remaining Bay Islands. Western Sector: Looking at the synoptic situation today, 19th, it seems the SWM winds in the Arabian Sea, and not gaining the momentum required, still below 20 knts. A UAC has formed in the Arabian Sea at 8N and 65E. This may slightly disrupt the "flow of events" arrangements in completing the SWM jig-saw puzzle. May not really hamper, as I expect this system to fizzle out westwards in the face of the domonant "High" in the Sea. In this sector, vast improvement are seen in the Somali Current winds blowing. The Somali jet is Northerly now. Should attain speeds of 30 knts by now. The SST off the Somali coast is falling. Remember, the SST off the Somali coast has to drop to at least 18-20c, now at 25/26c, and create a difference from the rest of the Arabian Sea SST to form huge monsoon clouds in the central Arabian Sea. (Matter explained in previous MW). 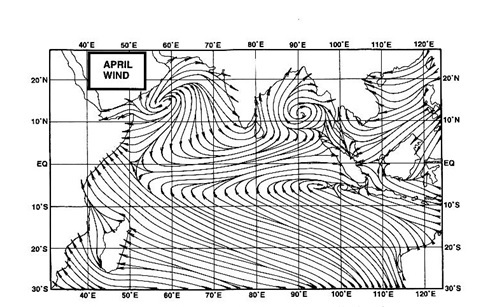 SW winds over the primary destination, Maldives, are still below 20 knts, not enough to usher in the SWM. The normal, the date is 20th, but it seems the Maldives and Sri Lanka would get the SWM, albeit a weak force, by the 23rd and the 27th resp. And, I would not be too sure of its initial momentum and intensity, as the MJO wave in this region seems to be fading, and going into a weak phase from the 26th of May to the 10th of June. The wind map shows the ITCZ along the equator stretching from Africa upto the Bay of Bengal. This parameter, the line, should move into the 5N region around the South Arabian Sea to carry the embedded Monsoon current along with it. Normally, I do not have doubts that this will hold up the advance, as in the Bay, the ITCZ is almost at 5N. Now, with the first meaningful heat wave getting underway in the Northern regions of the sub-continent, we can expect the seasonal low to develop in the Sindh/Rajasthan region and attain a core pressure below 1000 mb at a rapid pace. By next week, say around the 23rd, we can hope to see 998 mb in the Thar Desert region. SWM has feebly moved into the Southern Bay Region. SWM will start covering the complete Bay Islands from the 23rd, and subsequently, riding on a system, reach the NE states by the 1st of June. SWM could be expected over the Maldives by the 23rd of May. (Normal date 20th). Over Sri Lanka around the 27th of May. I would estimate the SWM to advance into Kerala around the dates initially estimated by Vagaries : June 3rd/4th could be the date for Kerala, but remain weakish till the 3rd week of June in coastal Karnataka and Kerala. Initially, riding on a strongish MJO wave, the SWM could precipitate good rains in Kerala. The further current into Kerala would be "reluctant" to move ahead in a weak MJO, as International forecasters predict the MJO phase in our seas to become weak after the 10th of June. This weak phase could last till 20th of June say the forecasts. Nevertheless, the SWM could progessively advance into coastal Karnataka 48 hrs from 5th June. SWM could advance into interior Karnataka, Goa and S.Konkan by the 9th, and Mumbai by the 11th/13th. of June. After the 15th of June, I would include entire Mah and South Gujarat as covered by the SWM. I would put the SWM in a weakish phase till the 20th. Vagaries has put up an advance map for easy reading. Intensity and strength of SWM in these regions will actually gain strength after the 20th of June. Moving into South Gujarat by 17th June and Saurashtra by 20th June. After 24th June, a sort of "pick up" could be expected, in precipitation in the SWM regions, and further advance in the Northern plains. Further advance will be tracked on around 1st of June. The Monsoon forecast for the Month of June put up by Vagaries MW-4 on May 2nd ..thus holds good. Mumbai can expect about 600-650 mms in June this year. These are my personal views and for commercial decisions consult local weather bureau. funny thing is imd has not announced any progress in south andaman yet...y so? ?